Oh, figs! My favorite summer fruit. Fresh figs are best enjoyed when they almost look too soft to eat. Stay away from the firm ones. Look for the figs that are starting to split at the bottom..just barely. Sometimes there will be a tiny glistening drop emerging from the star shaped fissure, that means it is perfectly ripe. The issue with figs is that many ripen at the same time, and if you eat too many you will clean your system right out, whether you want to or not? So what to do with over-ripe figs? A little too mushy eating means great for cooking. Jams, compotes, breads, wherever you can put fruit you can use figs. This morning I used them in pancakes. The pancakes themselves had a mixture of ripe peaches and figs in them. I roughly chopped the over-ripe figs and threw them in a saucepan with a little water and lemon juice while I was cooking the pancakes. 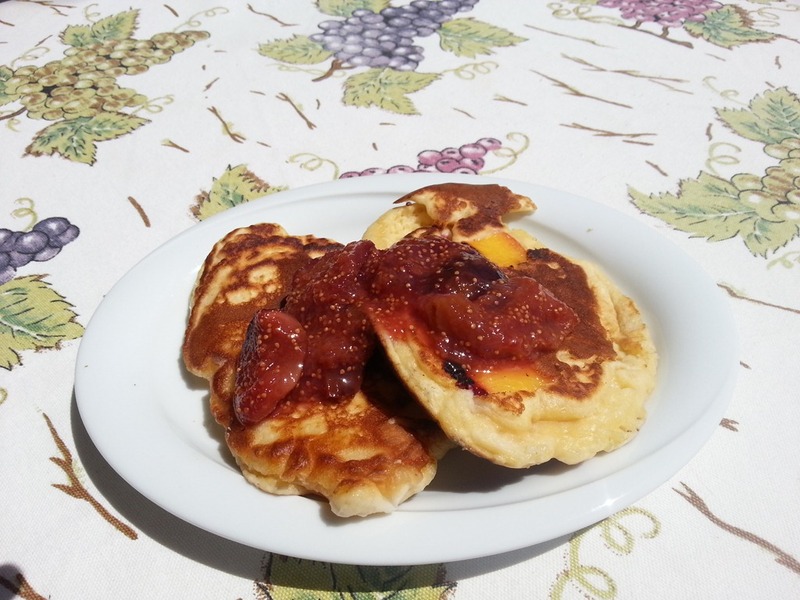 I used the fig compote as a syrup for the pancakes. I have to say, for a 20 minute cooking project (only as long as it took to mix and cook the pancakes) the results were delicious. In Turkey, fruits and vegetables are rarely available while out of season. This can be a little disappointing when you are craving a particular dish, but in reality creates a smaller carbon footprint and is better for the environment. This means that will there is only about a four week window for figs, during that time the figs are fresh and delicious, abundant and cheap. While I would love figs all year long, they seem just a little bit sweeter since they are so special now.